The Mars Reconnaissance Orbiter is helping to plan landing sites. Countlessscience fictions books and films have shown Martian armies attacking the Earth,marching across our planet and enslaving or eradicating any humans they comeacross. Obviously this hasn't happened ? yet! Infact, Earth is preparing for an invasion of Mars, but not in the conventionalsense. Right now a flotilla of space probes are assembling to storm ourneighboring planet, but rather than being armed with heat rays, they're kittedout with the latest in scientific equipment. Theirmission? To learn all they can about the red planet, and perhaps even answerthe question of whether it harbors alien life. It'scertainly an exciting time for Mars exploration. The rovers Spirit and Opportunity are still scouting out the surface and sending back incredible images. The PhoenixLander is on its way to Mars right now, and should arrive at the Martiannorth pole on May 25. After this will come NASA's MarsScience Laboratory, a large rover that will launch next year and arrive in2010. Finally, the European Space Agency's ExoMars mission is expected to hit theground in 2014. 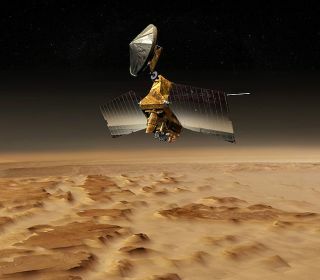 It'scertainly an attack in force, and two generals planning this assault areMichael Meyer, a lead scientist for NASA's Mars Exploration Program and LuannBecker, a University of California, Santa Barbara geochemist. Totest for alien life the missions will look for organic chemicals — strongclues that living organisms are there. Becker has developed the Mars OrganicMolecule Analyzer, or MOMA. She explains, "MOMA is like a Star Trektricorder because we can use it to cover the full gamut of measurements thatwill answer the question of life. Then we'll be able to address the difficultquestion of whether something interesting is there." Thiskind of thing has been tried before with the Viking missions of the 1970s,although the results were frustratingly ambiguous. Says Meyer, "Part ofthe controversy was with Viking's LabeledRelease Experiment. The concept was that if we added organics and water tothe Martian soil, all the Martian organisms in that soil would go to towneating the organic matter. The organics would in the process be broken downinto carbon dioxide gas, and we could measure that." Basically,samples were warmed up and given food-like chemicals and then watched to see ifany microbes reacted. Becker laments, "Viking was an excellent experimentif you think about the strategy behind it: going to Mars and heating a sample, somethingwe do everyday in our laboratory. [But] we got ambiguous results — somethingmight be there, but it might not be there. Anytime you get an ambiguous result,that's considered a non-result." The same idea of hunting for organic materials is used for modern missions. Halfthe battle is knowing where to look by deciding which areas are most likely togive interesting results. "Location, location, location," says Becker. "That really is key. We're going to have to use every bit of informationwe get from the satellites currently flying." NASA'sMarsReconnaissance Orbiter is taking high resolution photos of the Martiansurface, providing valuable intelligence about landing sites. However, a "shotgunapproach" is in the cards — scattering the various machines over differentareas to sample a range of locations. Says Meyer, "We are sending missionsto three different places. Phoenix is going to dig into the ice near the northpole. Mars Science Laboratory has a little drill, so it's going to go towherever there's exposed bedrock and rocks lying around. ExoMars has a bigdrill, so it's going to go deeper down into the surface." Withall these missions on the way, hopes are high that we'll soon conquer Mars byuncovering its most guarded secrets. However, past attempts like Viking haveproven that Mars is a difficult enemy to overcome. Still, lessons have beenlearned and many are optimistic. Victory could well be within our sights.